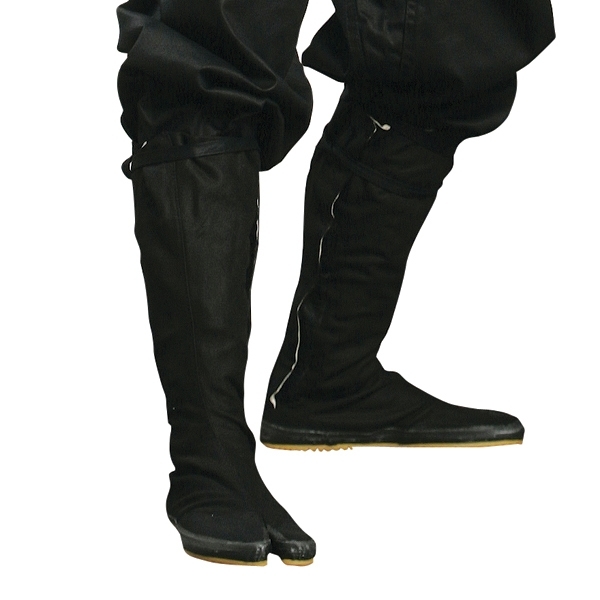 Ninja Tabi Socks are made of black 100% nylon and have the same split toe design as the tabi boots. One size fits all. 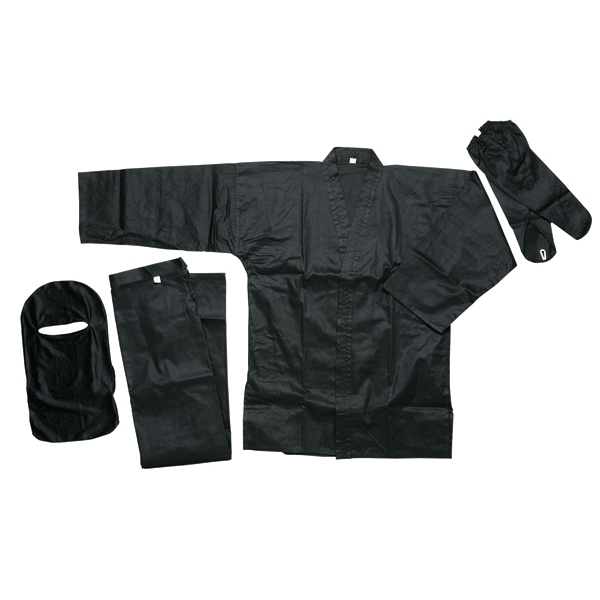 This complete Ninja uniform is perfect for Halloween, productions, or aspiring ninjas. 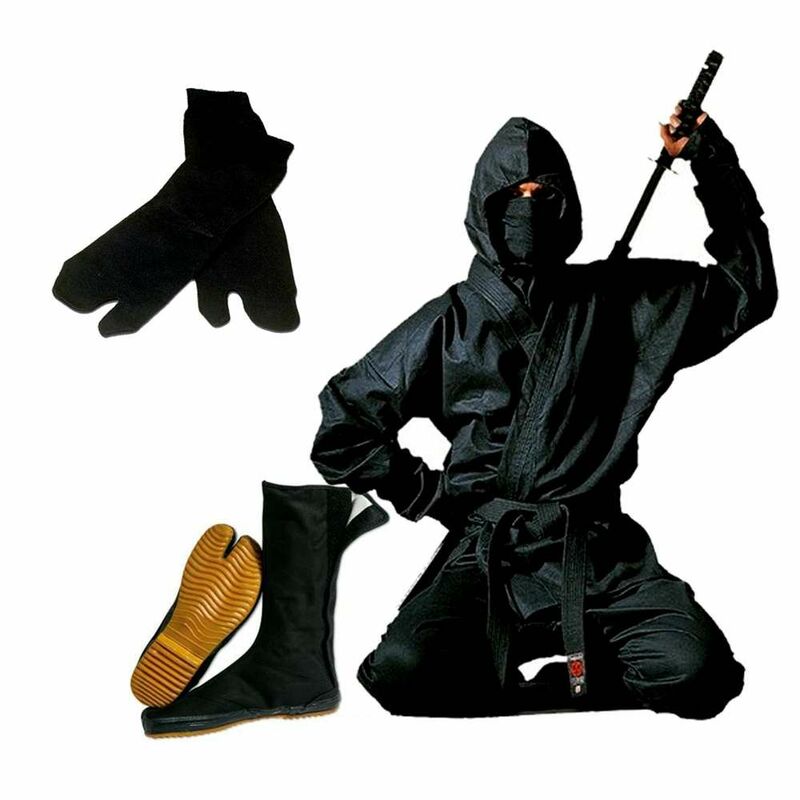 Your complete uniform includes: 1 jacket, 1 pair of pants, 1 pair of hand and forearm covers, 1 pair of split-toe Tabi socks, 1 pair of ninja Tabi boots, and 1 hood/mask combo! The comfortable jacket features a hidden "shuriken" pocket for holding small ninja accessories such as throwing stars or spikes. The pants features a double tie waist for a snug and comfortable fit. The pants also feature additional knee and ankle ties to keep your pants fitting as snug and comfortable as possible. 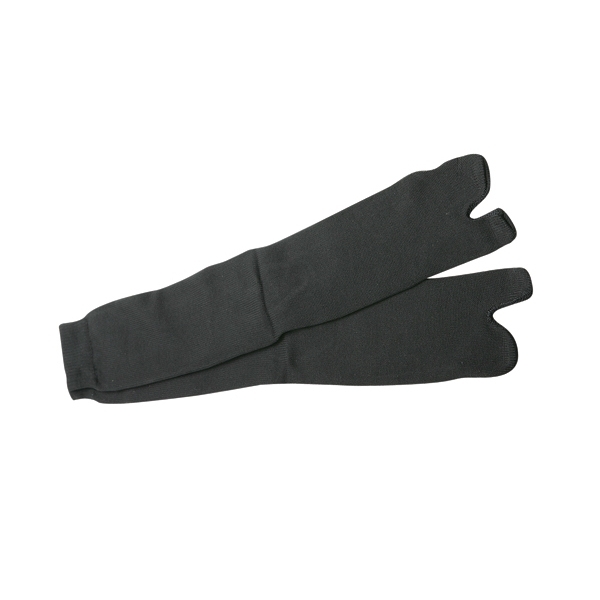 The hand and forearm covers feature finger loops for a better fit and preventing movement. The hood and mask combo is designed to conceal your face comfortably without restricting your breathing. The Tabi socks feature a split-toe design that allow a more comfortable fit for the split-toe Tabi boots. The Tabi boots also feature rubber bottoms that promote a better grip and silent foot steps. **PLEASE NOTE, THIS UNIFORM IS MADE OF 100% COTTON AND IS NOT PRESHRUNK. IT WILL SEEM VERY LARGE OUT OF THE BAG, BUT WILL SHRINK 3 TO 5 INCHES ALL THE WAY AROUND WHEN WASHED (APPROXIMATELY 1 WHOLE SIZE) DEPENDING ON HOW YOU WASH IT. PLEASE KEEP THIS IN MIND DURING FITTING. 1. We recommend you soak the uniform is a vinegar and water mixture for at least 1 hour to prevent color fading during wash. 10 parts water with 1 part vinegar. 2. To prevent over shrinking we recommend tumble drying in 5 minute increments. Once uniform is at the appropriate size, remove from dryer and line dry. 3. Once you have shrunk the uniform to the correct size, you will need to wash in cold and line dry going forward.. This thing ROCKS!!!! 5 I'm so glad I ordered this suit!! Best one I've used at my work so far. Ninja boots fit freaking great!! Make sure you know your ninja boot size folks! Pros:This thing is made for professionals!